You’ve made up your mind that this is your year for excellent oral hygiene, so you’re starting from scratch by evaluating your toothbrush. You want to make sure that you make the best selection and that your teeth will be getting the most thorough cleaning that they can. So gladly, you’ll accept the expert opinion of your dentist regarding this matter. Thankfully, she has decided to weigh in with her professional advice. Cost – In this department, the manual toothbrush wins because it is only a fraction of the cost of an electric toothbrush. Furthermore, it comes as one piece, whereas the electric option requires the purchase of a base and replacement heads every three months. There is also the added cost of batteries. Time – When it comes to time, the electric toothbrush has the advantage because it can produce between 6,000 and 30,000 strokes per minute, which the manual version can’t remotely come close to. Therefore, the general rule of thumb issued by the American Dental Association, that you should brush for at least two to three minutes, is rendered null and void by the fast-moving electric toothbrush. Control – The manual toothbrush offers considerably more control, which can become a huge factor in situations where you have sensitive gums and need to lighten the pressure applied to them. 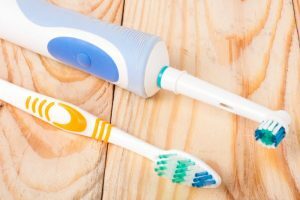 Ease of Use – Although the electric toothbrush offers less control, it is overall easier to use, especially for people who have a condition or injury that limits their range of motion, or ability to maneuver a manual toothbrush into hard-to-reach places. There’s always a bottom line, and your family dentist says it consists of two components: frequency and consistency. You need to brush and floss your teeth at least twice a day. This will remove excess bacteria and plaque that can collect on your teeth and gums. But you also need to be consistent in this practice. It does you no good to brush and floss thoroughly one day and then forget the next two. Therefore, the debate over the electric and manual toothbrush ends with you and your preference. Either one will do an excellent job of helping you maintain optimum oral hygiene, and ensure that when you visit your dentist for your semi-annual appointments, she will be able to tell that you’ve been a good steward of your mouth, teeth and gums. Dr. Jaclyn Jensen earned her Doctor of Dental Surgery degree from the University of Minnesota. Since then, her focus has been to provide her patients with comfort and make them feel like family. She practices at Renu Dental and can be reached for more information through her website.